With today being the first day of school for the Los Angeles Unified School District, this seemed like a good opportunity to share some great history from Boyle Heights Junior High School's student newspaper, "The Siren," which made its debut on 19 October 1922. The paper is a window into the community, the school, its students and the era and in coming posts, material will be shared from twenty-seven issues of the paper during the 1922-23 and 1923-24 school years, just a couple of years before the school name was changed to Hollenbeck Junior High. The staff included editor-in-chief Maurice Nathan and associate editors Regina Karasick and Herman Kretzer, as well as a feature editor, literary editor, editors for boys and girls sports, and a joke editor. There was a staff artist, Murray McClellan, a staff photographer in Clifford Garrett, and business manager Abe Turkel, assisted by Leonard Bastrup. Finally, there was journalism instructor Helene Kuhnle. Printing, of course, was a new offering in the school's curriculum and a room was set aside as a printing room, including, "two Chandler and Price job presses . . . [and] other printing equipment amounting to $3000 has been ordered. Eighth grade boys "will take a ten weeks' course in printing" and "in time, it will also be a 9th grade elective." Note that the school accommodated students in the 7th, 8th and 9th grades at the time. The masthead and headline of the front page for the first issue of "The Siren," the student newspaper of Boyle Heights Junior High School, now Hollenbeck Middle School, 19 October 1922. Courtesy of the Workman and Temple Family Homestead Museum, City of Industry, California. 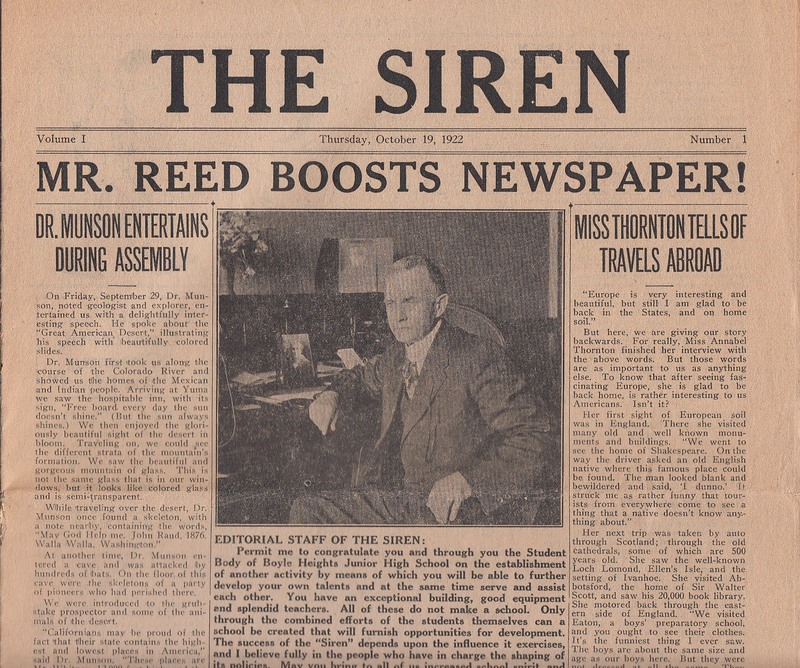 In this first issue, there was the headline of "Mr. Reed Boosts Newspaper!" referring to principal B.W. Reed giving permission for students to publish their own paper and writing a short note of congratulations to the editorial staff. He noted, for example, that "you have an exceptional building, good equipment and splendid teachers. All of these do not make a school. Only through the combined efforts of the students themselves an a school be created that will furnish opportunities for development." He wished that those students working on newspaper staff were able to develop a paper that brought "increased school spirit, and more of sunshine and happiness, thereby increasing our capacities for doing good." Several of the articles in the twelve-page publication dealt with travel or related subjects. For example, one teacher contributed an article about her European excursion, presumably during the summer break, while another wrote about her travels in Mexico. There was also a school assembly at the end of September by a Dr. Munson, "a noted geologist and explorer," who spoke about his travels along the Colorado River and surrounding deserts. Among his tales as one in which he said he found a skeleton with a note still nearby reading, "May God Help me. John Raud. 1876. Walla Walla, Washington." Another noted that he explored a cave, in which "were the skeletons of a party of pioneers who had perished there." A small item tucked away on page five noted that "our total enrollment is now 1617, the largest of any Junior High in the city." This is not surprising as continuing surges in immigration to Los Angeles were especially noteworthy in Boyle Heights and the east side in general. The next highest enrollment was McKinley Junior High (renamed George Washington Carver Middle School in 1943) in South Los Angeles, which had 1375 students. Boyle Heights' population included 834 boys and 783 girls. Other content concerned fires in Los Angeles, savings accounts, alumni news, trivia, short fiction, new campus buildings (including a boys' gymnasium 44' x 66' in size—the girls' gym was in future planning) and a lunch pavilion, both to be finished during the school year) and an athletics page. This latter gave football scores for the previous week, including city high schools. Because Roosevelt High was a few years from opening, the local school for Boyle Heights was Lincoln in Lincoln Heights, but the team was walloped by Long Beach High (now Long Beach Poly), 25-0. Another local game of note involved a contest between two local athletic clubs, Superior and Benito, with the former winning 7-6. It was noted that "the Superior Athletic Club is composed of present and former Boyle Heights students." There was also a feature called "Your Opinion," in which five students and faculty were posed "a question dealing with school affairs" and their answers published. The inaugural question was "What do you think of our practice of hazing scrubs?" Of course, scrubs would be the incoming seventh-graders, subject to the time-honored tradition, in many schools, of many kinds of "hazing." Not surprisingly, the two seventh-graders were far from happy. One, Alfred Chamwitz, bitterly noted, "Rotten. They get too many little fellows and turn yellow when they see a big boy." Willie Kaplan intoned that, "we shouldn't do it. Their opinion of the school is lowered in this way. It's a rotten stunt to pull on the helpless babes." Ninth-grader Aaron Karlin, however, felt that "it doesn't harm them" and even claimed that "they [the scrubs] enjoy it." His rhetorical response was, "if they do not object, why should we?" Another ninth-grader, Sam Zagon, though, felt the practice should be abandoned and suggested that older kids should be "welcoming the scrub and showing him around." Finally, instructor Mrs. Arrigonie simply said, "Poor little scrubs. Spare them!" 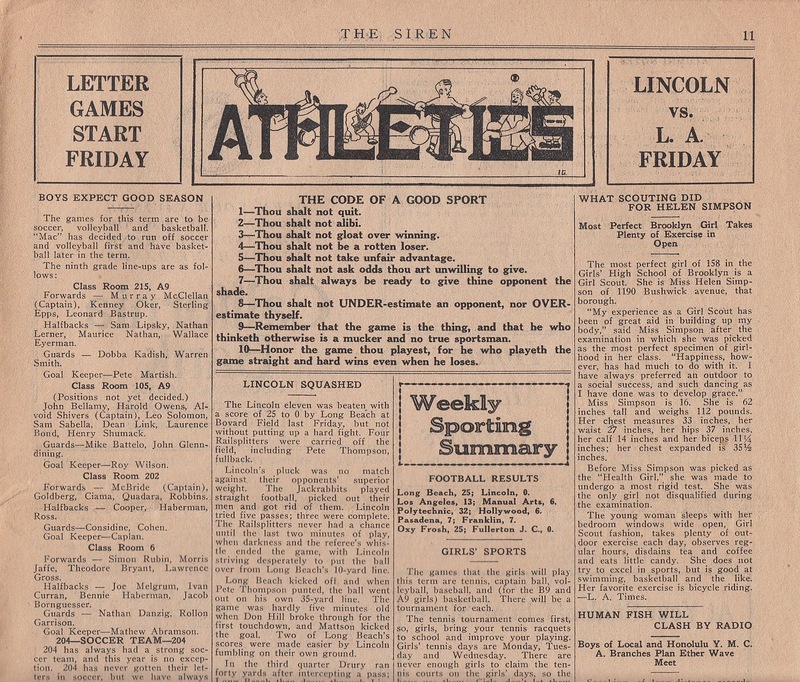 Page eleven of the inaugural issue of "The Siren" with the sports section, including the drubbing inflicted by Long Beach High (now Long Beach Poly) on Lincoln High, which Boyle Heights students attended until Roosevelt High opened a couple of years later. The paper also contained lots of humor and jokes, including "Want Ads" such as "Lost—A cane, by an old man, with an ivory head" and "For Sale—By Burbank farmer—If you want a big fat hog come out and see me." Another was an old classic that's been roamin' around for years: "Brutus—'Caesar, how many hot dogs have you eaten today? Caesar—'Et tu, Brute.'" Then, there's "Rich Dad—'My son is a writer.' Friend—'You mean he writes for money?' Rich Dad (grimly)—'Exactly.'" Additionally, there are a lot of advertisements from Los Angeles and Boyle Heights businesses, including the Boyle Heights Feed and Fuel Company at 2114 E. 1st; J. Rubin's shoe repairing shop at 2229 E. 4th; the Mission Meat Market at 1611 Brooklyn (now César Chavez); Jim Saporito's grocery at 607 S. Soto; A.S. Babb's furniture store at "2918 Whittier Blvd., formerly Stephenson Ave.," the name change just having taken place; the Hollenbeck Pharmacy at 4th and Chicago; and "The 5c Joint" at 6th and Mathews. This latter had some fun with their ad, noting that it had "that open faced counter where U get those T bone steaks in capsules easy to take" as well as "the famous Grapine Punch, right from Niagra Falls—Dempsey's famous punch [that is, champion boxer Jack Dempsey]." Also included: "the cooks says everything is free except the service" and "Everything is fresh except the cook." Now is the time to begin saving your copies of "The Siren," for this is the first issue. Lay this copy away, and the next, and the next. Some forty or fifty years from now, when you think of those times that you were a boy or girl, and are longing to be young again, you can get these copies out and read them over to your grandchildren. What a joy that will be to them for knowing you went to Boyle Heights Junior High. Through the upcoming school year, other posts will discuss more of the issues of "The Siren."